It’s the smallest principal town in Versilia. It is also the one located at the highest altitude (443 meters above the sea), on top of mount Matanna. The town’s territory is delimited by the Apuan Alps on the North-East, Camaiore and Pietrasanta on the South-West, and Seravezza on the West. It’s 12km from Seravezza, to which it is connected by regular bus lines. A network of tracks starts from the town, which allow to reach all the locations and the summits of the Apuane which surround it. 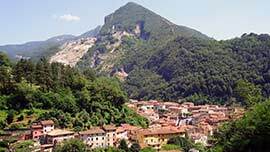 The town itself is quite off centred from its territory, so much that its legal location is in the hamlet of Ponte Stazzemese. It is inhabited by around 600 people; the economy of the town is limited to some commercial and tourist activities as well as some craftsman shops. The origin and meaning of its name, which first appears in documents from the end of the IX and X centuries, isn’t certain. The Town of Stazzema is divided into 18 hamlets, each one with its story and traditions. The hamlets are Stazzema, Cardoso, Levigliani, Arni, Terrinca, Pontestazzemese, Farnocchia, Sant'Anna, Pomezzana, Retignano, Pruno, Volegno, Ruosina, Palagnana, Mulina, Gallena, La Culla and Campagrina. It is located at about 3Km from Pontestazzemese. One gets there following backward the course of the river. The town was born in 1407 from the union of 3 villages: Cardoso, Malinventre and Farneta. The extraction and the working of a stone known since the X century and called Cardoso Stone takes on a great importance in today’s local economy. It is used to make doorframe, doorway, steps, etc. The town church, built in the first half of the XVII Century in honour of Santa Maria Assunta, is located in front of the beautiful 1745 bell tower. Leaving town, where one can enjoy an enviable cool during summer, it is possible to follow tracks of various levels of difficulty that allow to get to Colle Mezzana, Palagnana, il Monte Forato, below which are located various locations as well as the church of San Leonardo, of Roman foundation. The numerous Etruscan archaeological pieces as well as the recently discovered necropolis of the liguri apuani are witnesses of its ancient origins. Previously united to the adjacent hamlet of Terrinca, it became autonomous in the first decade of the 1500. It is of a considerable tourist importance. In fact, on top of being a place of summer villégiature of reference to the tourists staying on the Versilian coast, it also is a starting point to reach the Mosceta Valley (Valle di Mosceta), Mount Corchia (Monte Corchia), famous for its Antro and Mount Pania (Monte Pania). Located beyond Mount Altissimo (Monte Altissimo), the passes of Cipollaio (colle del Cipollaio) and Vestito (Passo del Vestito) separate it from Massa and Versilia. The Arni Valley (Valle di Arni) extends itself over about 3km; it holds extended pastures, chestnut and beech woods and great waters. The mounts that surround it are rich in silver lead, pyritic copper, in extended strata of navacolite, calcareous schist, Dolemite and white marbles. The first marble quarry was opened in 1849 by Mr Saucholle Henruaux. The mounts that surrounds it are: il Sella, il Vestito, l'Altissimo, il Cipollaio, il Corchia and il Frèddone. The Arni valley is the geographical crossroad between Versilia, Garfagnana and Massa. It is a small village anchored at the feet of Mount Corchia (monte Corchia), amid chestnut woods. Its population, scarce in winter, doubles during summer. The village is the most ancient in Versilia. Dominated by the Lombards since 766 a.c, it then became an autonomous town and finally a hamlet of the town of Stazzema. The church, richly decorated with marbles, its admirable oil on wood painting (Madonna del Carmelo) from 1600, the numerous Medicis shields and portals, and also the marble tombstones and decorative items from various Roman times are all to be admired. There are many and very interesting possible tours to take: Il Passo Croce, la torbiera di Paduli, il monte Pania della Croce, Campanice and also, il Puntato, il Corchia, Col di Favilla as well as other amazing place of the Parco delle Apuane. During the long walks in the chestnut and beech woods, it is possible to admire extremely beautiful flowers, blueberries and raspberries. 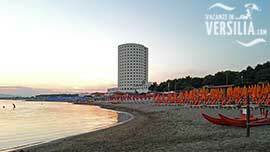 It is located at the point of confluence of the Canale delle Mulina and the Canale Versilia. In the background, you can see the characteristic Monte Forato, and on its left, la Pania della Croce. In the locality of Fornetto, there is a stone which testifies of the presence of Giosuè Carducci in this village during the period of his youth. 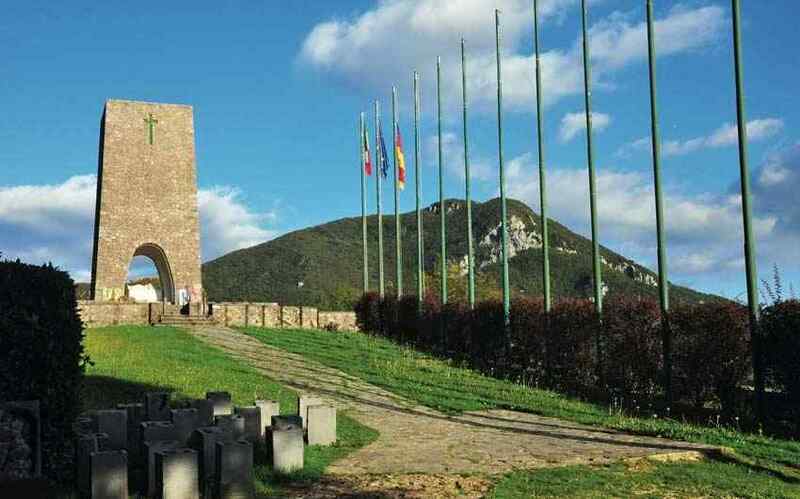 Going beyond the river, following a steep dirt road, one reaches the summit of a hill where a Monument has been built and dedicated to all the Alpine Soldiers (Alpini) fallen in war. During summer, the fresh climate turns the village into an oasis where tourists gladly come to. Instead, in the winter time, the village has a rather cold and humid temperature, given that it is located in a valley and along a river. Located in the middle of vast valleys of chestnut woods, tourists and vacationers appreciate it for its fresh and clean air. It also allows to watch and admire amazing sceneries and the most beautiful mounts of the Apuane: Matanna, Procinto, Forato, Pania Secca, Pania della Croce, Corchia, located to the North and East, while South, through a short walk, Monte Gabberi can be reached. From Monte Gabberi, it is possible to watch the coast that stretches between the gulf of La Spezia and Livorno and nice weather permitting, also the isle of Gorgona. At Farnocchia, there is a church dedicated to S. Michele Arcangelo, which original structure dates back to before 1000. Inside this church, you will find a pretty baptismal fountain, a monumental organ, the Altar of the Rosary, with its amazing tiles in bas-relief representing the 15 points of the Rosary, The Last Supper and much else still. During summer, several events, gastronomical and other, are organised. It is a small village located in a natural depression, dominated by Monte Lieto and Monte Gabberi; It became sadly known for the massacre of 560 people committed by the Nazi troops on August 12th 1944. The Canale dei Mulini starts from the village and stretches till Valdicastello, birth town of Giosuè Carducci. Around the village of Sant'Anna, you can find many hamlets and scattered houses which take the following names: Monte Ornato, l'Argentiera, Vallecava, Vaccareccia, i Bambini, il Moco, il Colle, Fabbiani, Sennari, le Case di Berna, Vinci, Franchi, le Case, il Pero, i Merli, i Coletti and further down, towards Valdicastello, i Mulini. Previously being part of the small town of Farnocchia, forming its mountain pasture, it then became a place where to live. The Charnel House Monument (Monumento Ossario) which gathers the remains of 560 Martyrs raises itself on top of the Pass di Cava (Colle di Cava). The piece of local stone work was built in 1948, a project of the Architect Tito Salvatori, and accommodates, above the common grave, a sculpture by Vincenzo Gasperetti which represents a young mother who is tenderly hugging to her chest, in a death embrace, her little girl that was killed. A Historical Museum has been built at Sant'Anna, town recognised as Regional Centre of the Resistance. The village and its surroundings are located in the “Park of Peace” (Parco della Pace).